Folklife Quarterly has reverted to its previous title, Folklife West, starting Oct 2018 issue. It will be 3 times a year from Jan 2019. ​who also provide some material online. 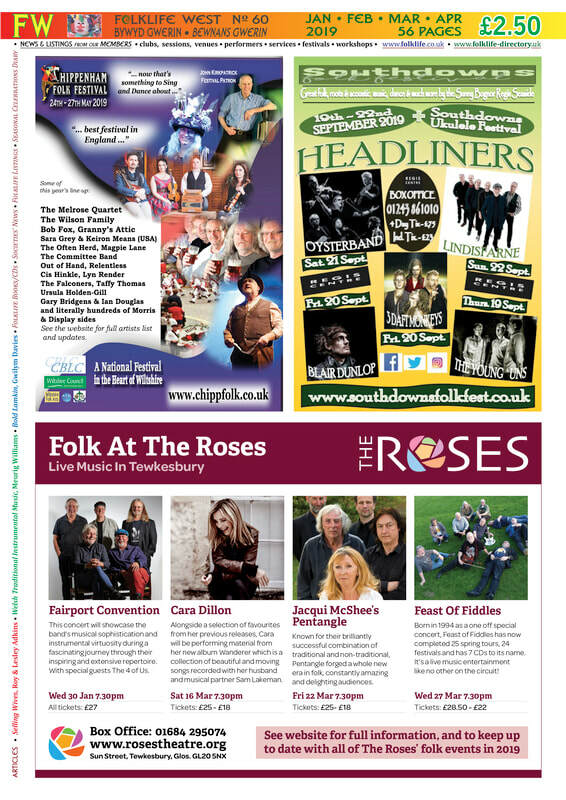 We also publish Folk What's On - simply the ads from FW, sent free to concert venues, libraries, TICs, etc. --- an archive of articles from the Folklife Traditions pages in FW. Also, a bilingual Welsh Traditions Directory, Bywyd Gwerin. FW's folk news from our Folklife members, which forms the first half of each issue. • News webpages: Wales. Then England: mostly West Midlands & West Country; mostly, a webpage for each county. Note: these webpages are copies of FW's A4-sizes pages, so may be too big for mobiles. ​(1) and (2) are from our Folklife members only. (3) open to all. Membership £15 a year, besides posting out FW three times a year, covers Members' news and online Directory listings. In FW, we print 1-line listing-summaries, plus a next-12-months festival diary, a workshops diary. Online, we have the full listings on this, our Members' Directory website. We have a fully indexed online archive for all issues on a new fully-interactive FT site! Full listings plus Jan-Dec seasonal local celebrations. Do email us . . .
FW is a print magazine - not a blog, nor email forwarding service! We don't use social media such as Facebook, Twitter, etc. We only print Members' news; researched articles; and a few ads. Member-performers news is welcome, including forthcoming CDs, tours, etc. For Festival Diary, don't use this form, pl email us directly the details as on Festivals page. For adverts, see below "info"
So Non-Members are asked not to send editorial details about performers, festivals, etc, nor CDs for reviews. We do include a few non-Member ads. 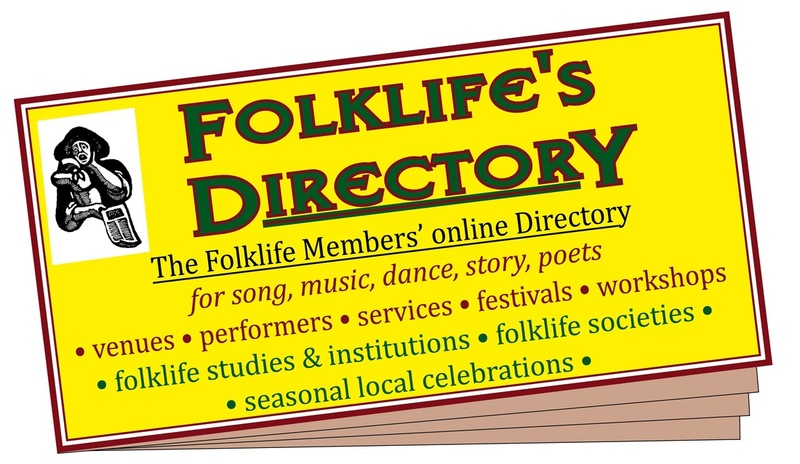 Folklife membership for Folklife West, a c.52 page (A4) print magazine, folk news (Wales, England West Country & West Midlands & Oxon) & folklife traditions​. To join: £15 a year. Please send by BACS to: Folklife, sort code 09-01-55, account 18675181.
or send us a £15 cheque to address above. EU £23. USA £30. Late changes after Deadlines? Possibly … conditions apply.
. . . . . . . up to 30th Nov , 31st Mar, 31st Jul as advert layout is finalised next day ! It is entirely up to our local Correspondents as to what they put in / have room for. Typically, venue details, but maybe not dates, with preference to smaller sessions etc - guest venues should take out membership (only £15 pa) to list their guests etc..
⇒ Do Join Us ! Reselling : 6 or more, 40% off + post-free! your Reports, Dates, Festival Info, CD Info. X not low-res eg copied from web ! Word limits are for 1 item, you can send in more than 1, eg 2 CDs count as 2 items. same word limits for “More Details” section. Articles & news ~ word limits by arrangement. For any notes: please use Endnotes. Please do not use Footnotes. stand out ………………… as advertising limited to just 1/4 of FW! ​value for money! … as your adverts will be shown for 4 months! ​Invoice price above. Prepaid £4 less. Book space by emailing your Purchase Order Nº. Invoiced terms = 30 Days from invoice date. Discounts; x2 issues, 10%. x3, 15+%. Further ads will not be accepted if money owing from last time ! - see our Guide to Page Sizes [<---this is on our main folklife site] - A4, A5, etc, with examples (A4-size pages, not suitable for mobiles). Other: any combination of 1/18 boxes (4mm between boxes). √ We use: Mac OS 10.7.5, Adobe InDesign CS 6. √ Colour ads: you are advised to send us a printout so we can check colours. √ If B&W: pl convert colour to greyscale, & check that before sending. √ PDF as High-definition 300dpi, text 600 dpi, fonts embedded; if B&W ad, send only as greyscale. You can "Save" Word as a PDF - design with a good margin or top or bottom may go missing! THEN GO TO⇒ "Save As PDF"